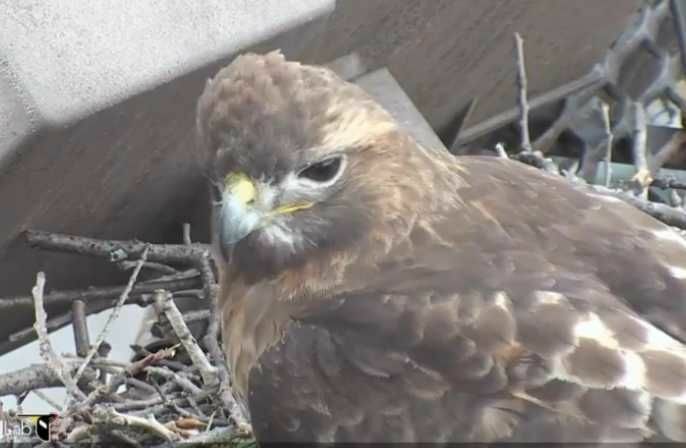 Ezra arrives at the 2015 CornellHawks nest with a vole and calls to Big Red, who swoops in, accepts the prey, and flies off. Ezra follows. Watch as the IR light flips to daylight as the sun rises over the Cornell Campus. Ezra makes a short visit to arrange some twigs in the nest and shape the nest cup. 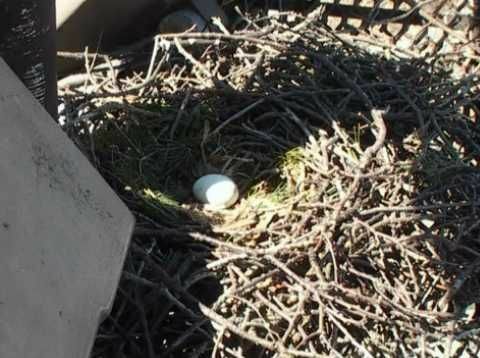 It's another eggciting day for Bird Cams! Congratulations Big Red and Ezra on the arrival of F3 at 4:06AM ET today! Ezra has been his usual efficient-foraging-self, dropping by with both a gray squirrel and an American Robin today for Big Red to consume. Ezra arrives carrying an American Robin, which Big Red takes and leaves to consume. Meanwhile, Ezra takes his spot on the eggs on this chilly but sunny morning. Hatch is in full swing at the nest, with one egg pipped and showing the moving bill of the hatchling within. 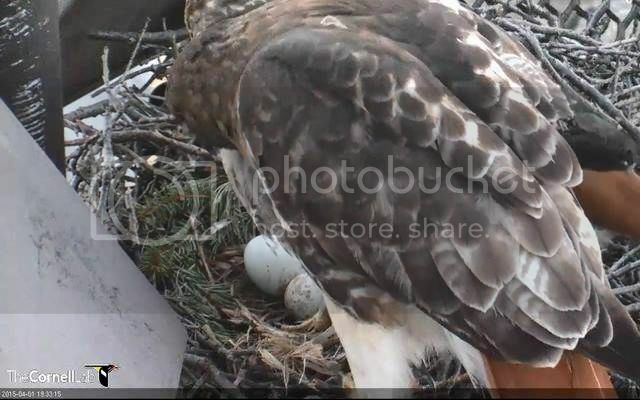 Check out this highlight from earlier today and be sure to tune in tonight/tomorrow morning for the first glimpse of a Red-tailed Hawk entering the world.